The H2O Inline Sediment Filter Cartridge is a replacement filter cartridge for Bottle-less Water Coolers. It is one of the stages applied for multiple filtration processes. 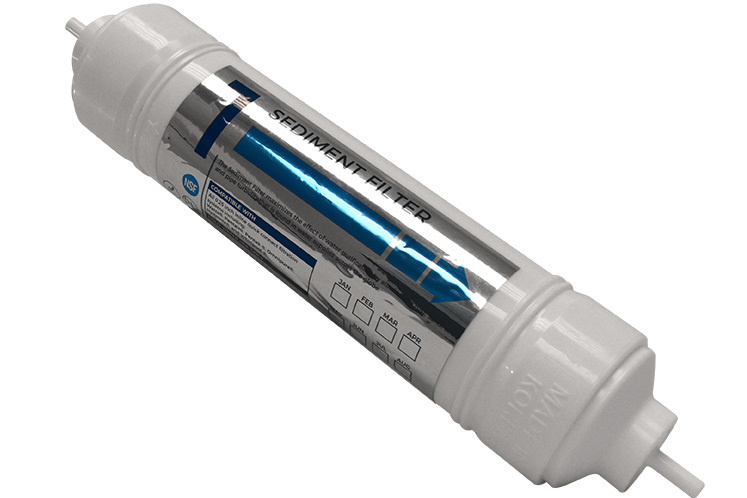 This Inline Sediment Water Filter reduces extra-fine dirt, sand, sediment, silt, rust particles, scale particles, bad taste and odors, and asbestos. Provides high flow rates for water output and dirt-holding capacity for filtration while maintaining extremely low pressure drop. H2O pleated cartridges outperform wound, spun, melt blown, resin bonded and other “depth” type filter elements because these cartridges are pleated to provide increased surface area and longer life. This filter can be used with our line of H2O bottle-less water coolers, and also in H2O Reverse Osmosis Water Filter Systems. It has built-in connectors and can be attached directly to existing systems with a standard 1/4″ line. Reduces extra-fine dirt, sand, sediment, silt, rust particles, and scale particles. Reduces bad taste and odor, and asbestos. Provides high flow rates and dirt-holding capacity while maintaining extremely low-pressure drop. 12 – 24 months filter life depending on feed water quality.